18-Nov-2013 -- This is the fourth out of 7 reports reaching 5 and attempting 2 confluence points in Botswana. The story starts from 24S 25E. The previous report is 24S 23E. At 6:30 AM we departed from Kang, a little town along the Trans-Kalahari Highway. After driving 90 km on the highway, we turned into a sandy road with very little traffic (we measured zero vehicles within 3 hours). This road goes straight through the Kalahari Desert for 250 km towards the Namibian border. We however stopped after driving 16 km in the middle of nowhere and parked our rental car under a single tree. The remaining distance between the road and the confluence point was 7.6 km which is most likely the reason why this point had not yet been visited. Such distance doesn’t sound too much, but considering the temperature, the thorny vegetation, the soft and sandy surface and the possibility of bumping into unwanted animals makes a hiking trip of the length = (2 times 7.6 km) times beeline-deviation-factor quite a challenge. Even though it was 7:30 AM at the departure from the car, the temperature had already risen into the mid-30° C. The actual danger would arise when something unexpected happens, i.e. a twisted ankle. To avoid the heat of the noon and to minimise Elionora’s waiting time, I ran to the confluence instead of walking. With the wind slightly blowing from behind with the same speed of running, I had almost no cooling factor. I sweated as much as one can sweat and even though I had drunk 1.5 liters of water prior to departure, I was soon dried out again. At a remaining distance of 2 km the vegetation consisting of thorny acacia trees got dense and progress slowed down because I had to crawl under some trees. Shortly before reaching the Confluence, one step was very painful: a thorn made it through my running shoe and through callused skin into my foot. I was bleeding, but when the pain faded away, I was able to continue cautiously. At 8:45 AM, I had reached the confluence point. The area around the Confluence and also along most of my way had been burnt down recently. The bushes and the grass are dry now at the end of the dry season. A luxury was the possibility to successfully send an SMS to Elionora at the confluence point, letting her know that I had reached the destination. Normally, I don’t expect cell phone coverage in the middle of a desert. The return was actually quite pleasant with some head wind which gave me some cooling. At 10 AM I was back to the car. We turned around, headed back to the highway and continued to Ghanzi to have lunch there. 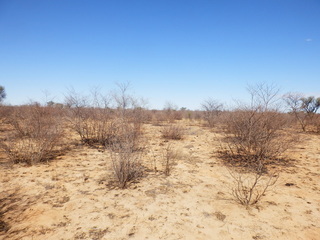 Vegetation: Scattered bushes and trees, bundles of burnt grass on the sandy ground cover. The story continues is at 21S 27E.